Once billed as "featuring the greatest cast in stage or screen history," Grand Hotel exemplifies the height of Hollywood allure in the early '30s, when the country was in the midst of the Depression and the institution of cinema supplied the dream factory escapism audiences desired. Grand Hotel is high melodrama at its best, an ensemble picture of wealthy and wannabe characters during a sojourn at a Berlin hotel. By reinforcing the resounding themes of the era — the examination and fallacy of wealth — and featuring top-notch production values, with today's eyes it remains interminably watchable and relevant. With a tent pole MGM budget of $750,000 — then an enormous sum — director Edmund Goulding is allowed to push the aesthetic of the studio style. His mise-en-scène has an elegant flow, showing much of the action in the lobby in long wide shots to convey the hustle and bustle of the hotel. The connectivity of his dialogue might have even been influenced by Renoir's revered Rules of the Game (1939). In the opening, in order to get over the hump of introducing his characters and their backstories, Goulding creatively shows us his half-dozen stars in a series of telephone booth conversations. Arguably the star among stars is Greta Garbo. 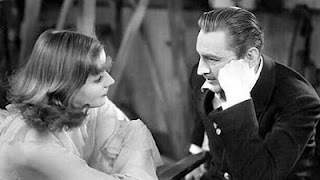 She's used minimally, playing a prima ballerina with stage fright who falls for John Barrymore, an elegant, erudite Baron, who, while exuding the cool, confident air of old money, is actually dead broke and casing Garbo's room for her jewels. Wallace Beery (who had just won Best Actor the year before in The Champ) uses his imposing physical presence effectively as a tough businessman under pressure to close a key merger, but has eyes for his sharp, spunky secretary, Joan Crawford. The young, attractive Crawford oozes charisma; her opening scene with John Barrymore is bristling with pre-code sexual innuendos. But the heart and soul of the picture belongs to Lionel Barrymore, as a downsized employee of Beery's, dying of cancer, but who, ironically, finds his freedom and zest for life in his last days. He's a wonderful, Capra-esque idealist, a personification of the common thematic thread of many of these Depression era films —the honour of success beyond monetary wealth. The Blu-Ray special features are anchored by scholars Jeffrey Vance and Mark A. Veira's unscholarly commentary, providing invaluable information on the production, giving the audience the historical context required to appreciate the full value of this picture.